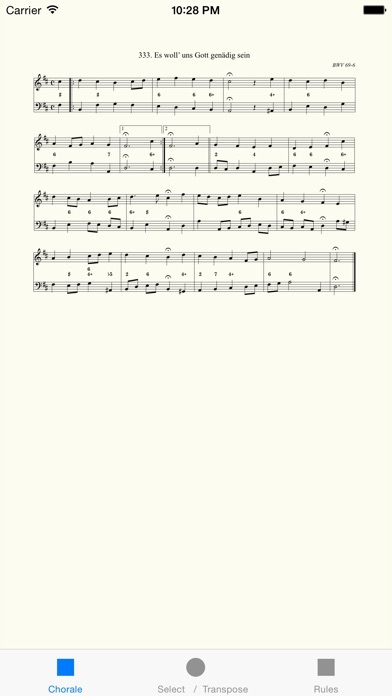 This App is a collection of four-part Chorales harmonized by Johann Sebastian Bach. When first launched, the Chorale numbered to the current day of year is shown. You can then choose any of the 371 Chorales with the "Select Wheel" found on the second screen. The "Text Switch" adds the title verse to the Chorale. The"Figured Bass Switch" replaces the alto and tenor voices with figured bass, thus highlighting the harmony and simplifying the music. The "Transpose Wheel" on the far right shows the number of half-steps you have chosen to transpose the Chorale from it's original key (displayed on the left). Practicing in all twelve keys is ideal.